One of the indicators of a great summer is the 4th of July festivities. For the Town of Windham, it was an action-packed holiday. People from neighboring towns gathered throughout the week to celebrate the birth of our free nation. Funded for the fifth year by the Windham Foundation, the OMNY Taiko Drummers kicked off July 4 with a free matinee concert at the Windham Civic Center. 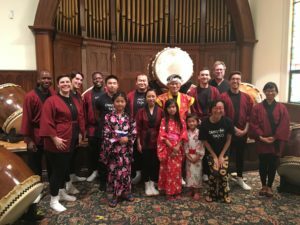 Led by Grammy award winner Koji Nakamura Sensei, the performance was exceptional! The drummers’ energy and vibrant presentation was spellbinding. In the evening, many food and product vendors set up their tents as the Town Parade marched down Main Street. “It’s always a good time to be able to give back to the community and participate in such a special holiday,” said band member, Emily Valerio. As one of the handful of seniors leading the band, Emily has taken part in multiple parades throughout her high school career. The holiday concluded with a colorful and memorable night of fireworks at Windham Mountain. As countless cars made their way to watch a traditional symbol of celebration, we all agree that Windham Foundation made this a festive day for everyone.